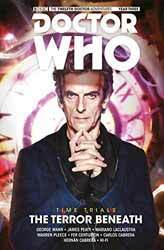 The Twelfth Doctor grapples with two deadly small towns in this brand-new collection, kicking off Year Three! It’s the return of fan-favourite comics companion, space bassist Hattie, as the Doctor takes her for the best fish and chips in the galaxy. But there’s something ancient and unknowable beneath the waves of the 1970s seaside town where they end up – something that weaves itself into Hattie’s disturbing dreams and drags itself up onto land in mounds of shambling seaweed! Writers George Mann (Doctor Who: Supremacy of the Cybermen) and James Peaty (Supergirl) team up with artists Mariano Laclaustra and Warren Pleece to chart the terrifying, continuing adventures of the Twelfth Doctor…! Can the Doctor and Hattie get to the bottom of a cosmological horror before it wipes the town off the map? Or will the Time Lord and his companion end up as fish food…? It is sneaky of writer George Mann, in a story called Beneath the Waves, to begin his tale underwater, with the Doctor looking out of a porthole into the depths of New Oceana, an abandoned colony world, drowned by rising sea levels and catastrophic global warming. However, it is not beneath these waves that we remain. It is also sneaky of Mann to reintroduce the robotic Quarks (as an independent invading force, without their Dominator masters, as they were during their stint in TV Comic during the late 1960s). However, they are soon dispensed with, and the Doctor is off on his travels again. He returns to the artificial colony world of the Twist, where he hooks up again with punk bassist Hattie, who previously appeared a couple of graphic novels ago, the last time that Mann was writing. Hattie needs a break from her hectic rock-star lifestyle, and so she rejoins the Doctor for a trip back in time. It’s a trip that takes me back to another late 1960s story. With the appearance of walking seaweed creatures, a base under siege (in this instance a seaside hotel in 1979), and a victim of the monsters wading calmly out into the sea, could this be the return of the parasitic plants from Fury from the Deep? Sadly, no. This is something new, though curiously the similarities to that old foe aren’t mentioned. There are also coincidental commonalities with the Series 10 episode Thin Ice, with its underwater creature, with its huge eye… and I’d better not say any more for fear of giving away the ending. Mariano Laclaustra’s artwork looks a little rushed during the final few pages of this strip, though it is generally strong, the highlight being the impressive underwater sequences. Look out for a mirrored detail from Michelangelo’s The Creation of Adam. The back pages of the graphic novel show just how much colourists like Carlos Cabrera contribute to bringing comic books to life, adding details such as light and shade effects, and bubbles to the submerged scenes. On the whole, though, it may not be deep, but Beneath the Waves is an entertaining adventure to immerse yourself in. Travelling alone, the Doctor heads back to the 1950s for a creepy slice of small-town Americana – a small town that is facing the curse… of the boy with the displaced smile…! The one-shot The Boy with the Displaced Smile was originally published in between the first and second episodes of Beneath the Waves (possibly due to a delay in the production of that story), on the rather flimsy pretext that the Doctor, under mental attack, was experiencing a flashback to a previous adventure. Here, though, The Boy is not displaced, being presented in the much more sensible position of straight after the three-part seaweed story. Here we have another coincidental resemblance to a Series 10 episode, or rather to its title: Smile. However, the grin in this story, a giant one that floats in the sky above the town of Sweet Haven, is more like the disembodied mouth of Prosser the Jigsaw Man in the Judge Dredd epic The Judge Child Quest. The effect of the smile is to make the townsfolk behave like zombies, evoking a George A. Romero movie or The Walking Dead. I was also reminded somewhat of Preacher, thanks to the setting (complete with a trigger-happy cop and a boy who lacks a proper mouth) and the stylistic similarities of artist Warren Pleece’s work to that of Steve Dillon. Of all the incarnations of the Doctor to be tackled so far by Pleece, perhaps the Twelfth is his least successful, looking rather more like Clint Eastwood than Peter Capaldi for much of the time. Writer James Peaty’s characterisation is also a little off – the Doctor claims to be a good judge of people, but in this body he usually isn’t. Almost inevitably given its duration, The Boy with the Displaced Smile feels rushed, as Peaty has to write in a one-off companion, in the form of waitress Penny Barker. She and the Doctor therefore bond immediately, with her telling him to “shut up and run” after just three pages. Nevertheless, there are moments – such as the Doctor approving of the name tag on Penny’s uniform, which he finds “Very efficient” – that will place a smile on your face.